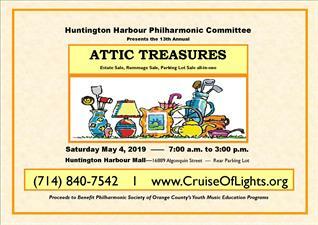 The Huntington Harbour Philharmonic Committee, supporting music programs for school children in our community, presents the 13th Annual ATTIC TREASURES giant estate/garage/rummage sale in the Huntington Harbour Mall Parking lot. 16889 Algonquin St. (behind Trader Joe's). Antiques, collectibles, clothing, handbags, jewelry, housewares, games, toys, one-of-a-kind treasures, and much more. ONE DAY ONLY! Saturday, May 4th. 7:00 a.m- 3:00 p.m.